The condition expressed in immature organisms, which are generally smaller in size than the adults and lack reproductive capability. The seedling represents the juvenile stage of many plants. The term is particularly used when the young plant form is very different from that of the adult. For example in gorse (Ulex), the juvenile leaves are flat and trifoliate but the adult plant has spines. In many conifers the seedlings bear needle-like juvenile leaves, and specialized leaves, such as the scalelike leaves of cypress (Cupressus) and the dwarf shoots of pine (Pinus), are formed later. The change is not always from a simple to more complex form. For example, in ivy (Hedera helix) the juvenile leaves are lobed while the mature leaves are entire (see diagram). The submerged leaves of many aquatic plants are similar to the juvenile leaves of terrestrial forms of the same species. In some varieties of ornamental plants the juvenile foliage persists in the adult plant (see also neoteny). Juvenile plants may also differ in various physiological ways from mature plants. For example, the immature forms of many deciduous trees, e.g. beech, do not shed their leaves in autumn but retain the dead leaves on the plant throughout the winter. 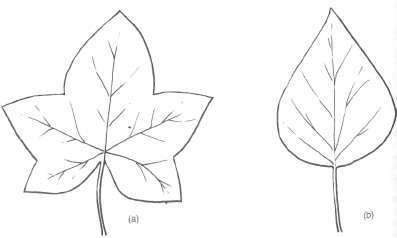 Juvenile (a) and mature (b) leaves of ivy.